We created a recipe you wouldn't normally catch us making or eating pre-keto. But now, we wonder why we weren't always ordering it at Italian restaurants. We made a Keto Lasagna for all our readers, but realized in the end that we were also making it for ourselves. We came away with a new recipe and a new love for a food. Matt in particular is not a fan of most of the recipes I make that involve layering and piling of different ingredients, unless it's protein cake! It wasn't until he tried our buffalo chicken dip, keto broccoli cheese soup, pizza dip, and now this keto lasagna that he realized he has a similar palate to mine! 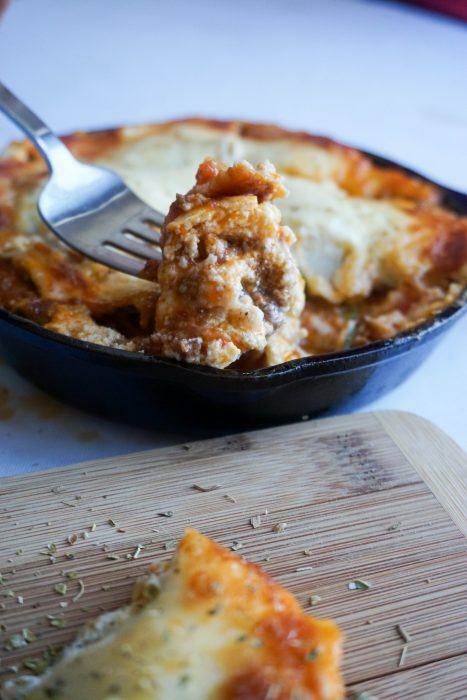 We are chalk full of low-carb dinner recipes, but we have to say that this keto lasagna takes the cake... pie... lasagna. It takes the lasagna! A serving of this will leave you feeling as full as if you had the carb-o load of noodles, but without the feeling that you have to run a marathon to justify it. You can even have a little fun with it and use squash for the noodles, use ground chicken or pork and use different, exotic cheeses! What makes this lasagna keto? The noodles. 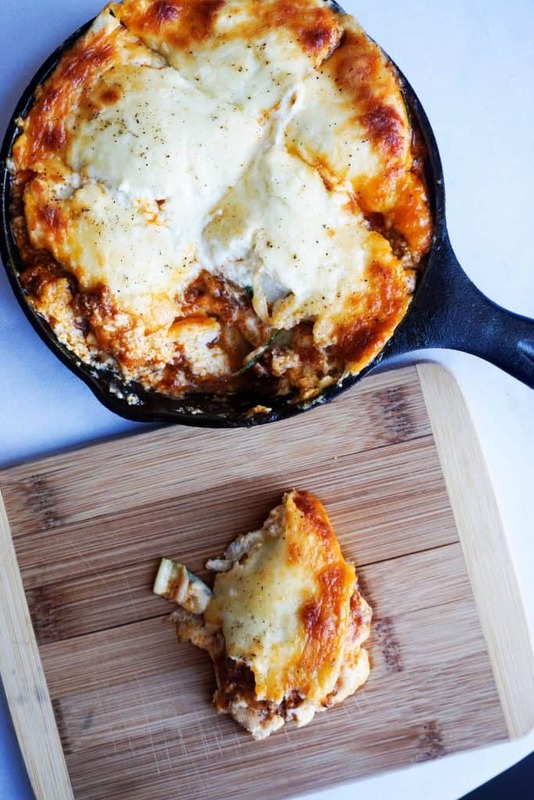 We used zucchini to create the perfect illusion of a hearty, cheesy lasagna! There are many way to prepare the noodles. You can heat them on the grill or in a pan as seen here or you can just slice them with a mandolin and use them raw like we did! We found that using them raw and allowing them to cook in the lasagna allows them to stay firmer creating more of a bite. We went overboard on the cheese in this recipe, but is that ever a bad thing? We utilized three unique cheeses, ricotta, Parmesan and mozzarella to create the perfect creamy balance. 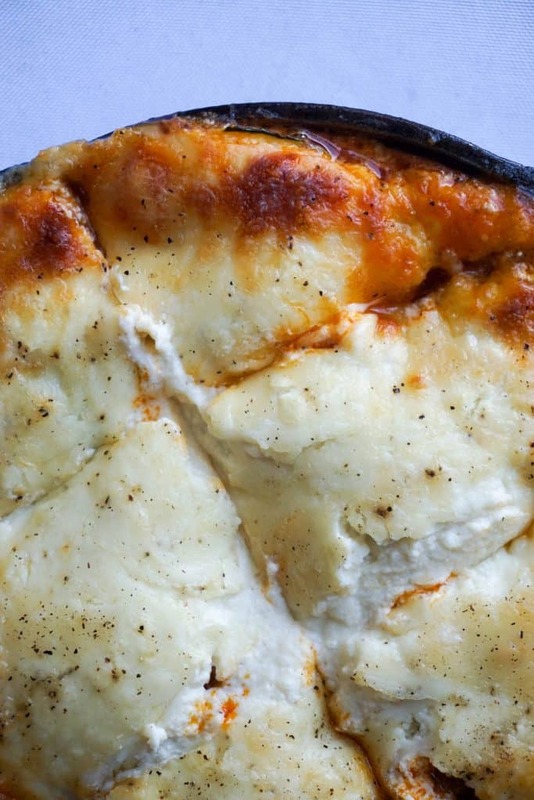 This isn't our only recipe that goes overboard on the cheese. We also have a Keto Broccoli Cheese Soup reicpe and a Low Carb Pasta Alfredo recipe! Although they make sure to give you a cheese party in your mouth, we have to say that our Keto Lasgna does the best job! Recipe can be quickly added to MyFitnessPal - Search "KetoConnect - Keto Lasagna"
Add coconut oil to a medium high heat pan and cook the ground beef. Add the tomato sauce to the ground beef and combine. Set aside. Using a mandolin slicer, slice the zucchini into as many thin slices as possible and set aside. Add the ricotta, Parmesan, garlic cloves, salt, pepper, and egg to a processor and blend until fully combined. In a oven safe skillet or casserole dish first make a layer of the ground beef. 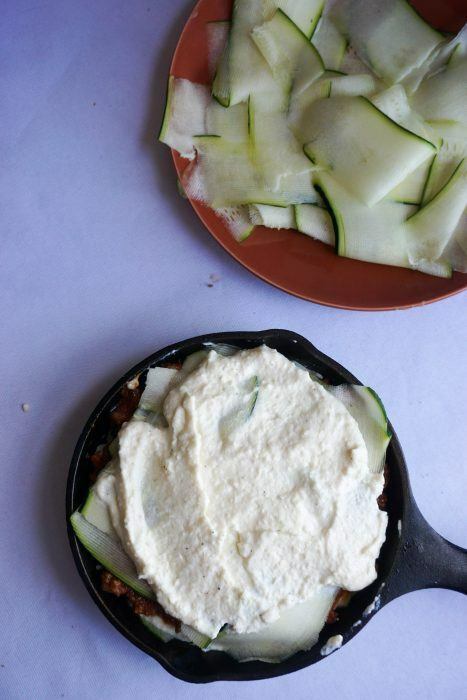 Make two layers of the zucchini criss crossing. Add a generous layer of the ricotta mixture. Sprinkle on some of the shredded mozzarella. Repeat this a second time (we made two full layers in our 6 inch skillet). Last layer should be the mozzarella cheese. Bake in a 350 degree oven for 30 minutes or until cheese is browned.